This Seth Thomas office wall clock has a great story. A 1915 reference to this clock can be found online in the “Larkin Factory-to-Family Plan” Catalog #73, p.156. Features include One key for winding stem and to open/lock the case. Gorgeous mid century modern Seth Thomas "Starflower" wall Clock. Dated June 1, 1973. Antique Seth Thomas No. 2 Regulator Wall Clock. Condition is Used. Working clock with all parts. Wood border on face has 1 crack and the side of the frame may have been painted at some point. I included a picture. Here we have a seth Thomas strike gong ,used for wall regulators or parlor city series style clocks. These should not be too visible when hung on a wall. Made of brass, wood and thick beveled glass. I think it could be easily removed. It has been tested and works great. It runs on one "AA" battery (not included). Mov't 3130/Cat No 3722. Seth Thomas Clocks. SPRAY Wall Clock. The left knob when pushed removes the red dot. This weight weighs 7 lb. Seems to work fine. A couple of light black marks on it. Hi- Very cool 1960's-era, Seth Thomas Wall Clock. The face is a brushed brass finish, and the outer ring and stems are a bright gold finish. The original clock hands are slightly bent ( Pictures 2 and 6). SETH THOMAS GREENBRIER 2321. ONE OF A KIND WALL CLOCK IS A GREAT PIECE OF MID CENTURY MODERN. BRASS FACE HAS ONE SMALL DENT. FINISH IS PEELING FROM THE RAYS. THERE IS ONLY ONE HAND. The case is dirty with scratches and the silvered dial is in nice shape. 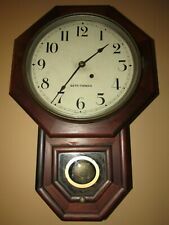 ANTIQUE WOOD CASE, SETH THOMAS CONNECTICUT GALLERY WALL CLOCK LEVER ACTION WORKING, KEY-WIND GALLERY CLOCK. WORKING WALL / GALLERY CLOCK. THIS IS A VERY NICE ANTIQUE CLOCK, IN WORKING CONDITION. VINTAGE SETH THOMAS TALLEY TIME & TIDE CAST IRON CLOCK - QUARTZ MOVEMENT. Measures 6 1/4” across the base. Overall Nice Condition. If you have any questions please feel free to ask. Thank you. Shipped with USPS Mail. Vintage Seth Thomas School Wall Clock!! Condition is Used. Shipped with USPS Priority Mail. Works perfectly however, does have small crack in lower front and minor scratchs, not noticeable. Warranty on back states purchased in 1988. It is in running condition. 1 3/4" from center hole to the winding hole. One front bushing has been pinged. 9 1/2" pendulum. The Geneva stop is missing. Late 1800's Seth Thomas clock there is still a partial label on the back wall on the inside of case. Seems to be working as it should. The Glass Bezel is missing. THE CLOCK IS BEING SOLD “AS IS”. Mid Century Seth Thomas Cream Apple Wall Hanging Clock 1950s Kitchen Works! Clock made in USA. Works good, see photos for condition. Includes what you see in pic, 2 weights (one loose and one is in clock). If you are ordering a necklace and we forgot to list the length- ask if that is important to you. We will try to make it right. For those with early Seth Thomas Regulator 2s whose labels are trashed or missing, this is an exact copy of the 7 1/2" x 3 1/4" black and gold label found in late 1800s Regulator 2s. The high resolution image is printed on 70 lb. Seth Thomas Ogee Wall Clock/Weights And Winder. Condition is Used. I’ve cleaned and adjusted the movement. It comes with a key and weights. Because it’s an Antique Clock it’s being sold in “as-is” condition. PayPal to be paid at auction’s end...Good Luck! For a 3.75mm winding arbor. Looks new and works great ! Reinforce hanger by adding missing screw., a serial(?). number stamped on the dial bezel, and the original SP label. An opportunity to own a very rare, original SP station clock. Improve appearance for aesthetic suitability. George Washington Seth Thomas Banjo Clock. Condition is Used but working. Shipping $35 with shipping insurance. Seth Thomas 70s MCM Gold Starburst Wood Grain Wall Clock Tested Diamond. Condition is Used. Shipped with USPS Priority Mail. PRE-OWNED Seth Thomas Destiny Series Wind Up Wall Clock, 4 Jewels, Made in Germany in very good condition with minor sign of wear, all pictures shown from actual item you'll receive! Exact reproduction of the older style beat plaque used on the Seth Thomas number 2 Regulator, and many other models. Made of solid brass. 3 7/16ths long. (IMPORTANT, see below). Occasionally, but rarely, I will run out of an item. The picture is just paper put behind the glass and I don’t think the clock face is original either. 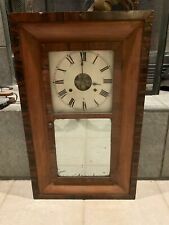 24" Tall Seth Thomas Cottage Clock Wall Hanging Wood Quartz Vintage Pre-owned.! Clock is battery powered, with1 AA battery. Made of brass and wood. Porthole opens. Clock works, not sure if the hygro/thermo works. Condition is very good, just a few minor blemishes on wood. Wonderful Seth Thomas wind-up pendulum wall clock. Cool mid century key hole shadow box style. 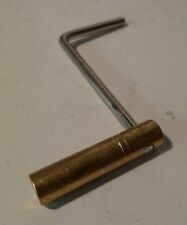 Original winding key included. Complete and stamped S.T. 9 1/2". on frontplate - Out of a 12" schoolhouse clock. 12 1/2" to bottom of bob. 1 3/4 to winder. It has a weight driven clock works. It is 25" tall. It has a little bit of veneer missing on the bottom of the front. A good looking old clock. Down from the attic --Antique 1930s Seth Thomas Wall Clock---George Washington/Mount Vernon with eagle top---It was running and chiming when we put it in storage but now it doesn't----Maybe a good cleaning??. Top door has back latch(wood piece) to secure. Hour strike and appears to be functional. Made by SETH THOMAS In U.S.A. Clock in as found condition. Appears to be complete. Scratches and other imperfections from normal use and storage. It is all Original. The wood is in great antique condition. Has been in my family forever. I believe it is solid Oak. Very nice face and hands. The label has brown spots, stains and age-related discoloration. 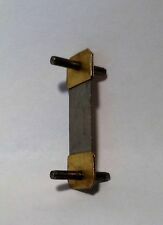 The 2 brass plates are 3-1/2" wide, 4-1/2" high and 1-1/4" apart. The clock is in very good condition. See photos. 10# 20 20 10. Repro Fancy Seth Thomas No. 3 Regulator Pulley, Nice!